Purchasing a home can be one of the most stressful situations that you will encounter in your lifetime, especially for first time buyers, simply because of the magnitude of the commitment as well as the complexity of the process. My goal is to provide you with the best service possible to assist you to achieve your Real Estate goals, yet still have an easy, successful and hassle free experience. Prepare a thorough Comparative Market Analysis (CMA) for you. This analysis report would include information regarding the current Real Estate market; it will also include all homes on the market based on your criterion whether they are recently listed, active or recently sold. Through my website, my powerful search system Virtual Office Website (VOW), you can create and save your personal search, bookmark your favourite listings and have the new listings come to you as soon as they are available on the market via email. Alternatively, I can set up a comprehensive listing search system, so as new listings come on to the market that match your criterion, they will be emailed to you immediately. You can then decide whether you would like to pursue them further. If there is a home or an apartment unit that seems particular fitting to your need, I will either phone or email you right away in order to avoid any delay. It is my practice to attend my office's agents tour, Vancouver Westside agents' open houses and Richmond realtor tour weekly. These realtor tours are meant for all the Real Estate agents to get a preview of new listings that have come on the market. During these tours, I would pay attention especially to any properties that are located in your desired neighbourhood; if any properties match your criterion, I will notify you immediately. Arrange for tours and show you all listed properties that are appropriate to your needs. In the event you should want to make an offer, I will explain the process, discuss options with you, prepare all legal documents, present it to the seller and negotiate the offer in your best interest. I have a legal obligation to uphold your integrity, protect, and promote your interests. Assist you to ensure that you are provided with professional services regarding, financing, certified home inspections, appraisals, lawyer/notary public services, and insurance agents; thus, you are well represented through this important process. Arrange, and be present for any agreed upon home inspection and home appraisals. Send all documentation to your chosen lawyer / notary public / mortgage broker and follow up with them to the completion to ensure a smooth transaction on behalf of both parties. Arrange to pick up and transfer the keys to you as the new owner. Follow up after the transaction has completed with you and assist you in any way possible to make your move as hassle-free as possible. 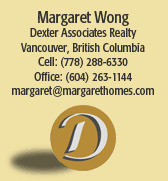 Keep you informed of the Real Estate market condition by way of my quarterly market newsletter. Earn your trust, respect and develop friendship for future years.